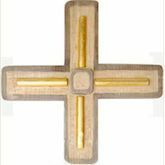 In order to offer our customers a wide selection of crosses, we have added our more crosses to our online catalog. There are 2 modern day crosses without corpus, and 2 crucifixes with corpus. Take a look at our new arrivals! previous: Spring is around the corner - discover our new flowers! next: Create your personalized wooden block!